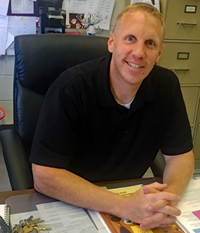 My name is Bryan Skrzyniecki and I am the Assistant Principal of Rossford Junior High School. It is an honor and a privilege to be part of each student's educational journey through junior high. I am a graduate of Rossford High School and have lived in the Northwest Ohio area since 1990. I have worked as an administrator, teacher and coach of students in a junior high and high school setting. As a coach, I have worked with elementary and pre-school aged children. My wife, Julie, is a teacher at Eagle Point Elementary. We have three wonderful children of our own: Nathan, Leah and Megan. The mission of the Rossford Exempted Village School District is to educate and graduate all students to become creative, productive, and respected members of society. The Rossford Junior High School staff works hard to accomplish this mission and go the extra mile to ensure that every child is successful. The empathy of the faculty and staff, along with their dedication to excellence, provides every student with a safe, positive learning environment.